Soon enough, we will no longer see waste on our streets. No, we are not lying. Barking is about to boast Britain’s largest underground bin system – and Kwik Sweep, London’s most customer-friendly waste removal company, could not be happier about it. When it launches in 2019, this system will be able to reduce on-street bins by 98 per cent, setting the tone for what is likely to become a visual, eco-friendly revolution. 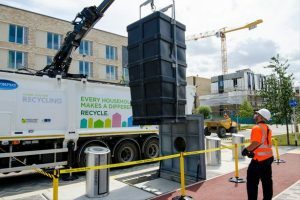 The system will include a total of up to 460 waste collection points across a newly-built housing development in East London – serving 10,800 homes and replacing the 19,000 conventional bins that would have otherwise been needed to store waste in the area. Both mixed and residual recycling, but not organic waste, will be dealt with via this new automated system. With it, collection cycles will only take minutes – a remarkable advanced if compared to the lengthy and often environmentally-costly process involving the use of refuse collection vehicles. It is estimated that this automated system will reduce waste-collection carbon emissions by ‘at least’ 90 per cent. That said, this innovation is, sadly, driven by aesthetics. It is, nonetheless, a positive step forward in the fight for a greener planet. Envac has already installed over 800 of these systems globally. This will be London’s second – and will hopefully inspire more developers to adopt a similar solution. In the meantime, Kwik Sweep remains London’s number one provider of eco-friendly waste removal and collection solutions. Get in touch now. Our friendly advisers are here for you.